Daniel the Stylite* (c409 – 493) was born in Maratha in upper Mesopotamia, Turkey. He entered a monastery at the age of twelve and lived there until he was thirty-eight. During a voyage he made with his abbot to Antioch, he passed by Tellnesin and received the benediction and encouragement of Simeon Stylites. Then he visited the holy places, stayed in various convents and retired in 451 into the ruins of a pagan temple. He established a "very large pillar" four miles north of Constantinople. The owner of the land where he placed his pillar had not been consulted, and he appealed to the emperor, Gennadius. He organised for Daniel to be evicted but for some reason ordained him a priest against his will, standing at the foot of his pillar. When the ceremony was over Daniel administered the Eucharist by means of a ladder. Daniel lived on the pillar for 33 years. By continually standing, his feet were covered with sores, cuts and ulcers. "Hold fast humility, practice obedience, exercise hospitality, keep the fasts, observe the vigils, love poverty, and above all maintain charity, which is the first and great commandment ....."
* A stylite, pillar dweller, or pillar-saint is a Christian ascetic who live on pillars, preaching, fasting and praying. Stylites believe that the mortification of their bodies would help ensure the salvation of their souls. 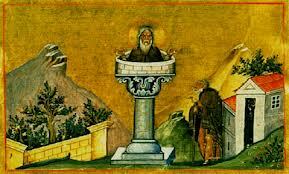 The first stylite was probably Simeon Stylites the Elder who climbed a pillar in Syria in 423 and remained there until his death 37 years later.